Yesterday, January 16, 2019, will go down in history for the passing of John Bogle, fondly known as the father of index funds, who died at the age of 89. John had always been an inspiration for every investor, including myself, as he single-handedly changed the mutual fund industry forever. He was the first to create a mutual fund tied to an index such as S&P 500 and made index investing a popular phenomenon. He revealed to the world that active fund managers rarely beat the benchmark indexes on a consistent basis and are plagued by exorbitant advisory fees and high operating costs. He kept the cost of indexed funds low to enable the average investor to benefit from it. We owe him our gratitude. It is due to his efforts that the fees charged by asset managers have come down over time which has resulted in savings of hundreds and thousands of dollars in our brokerage accounts or 401k plans. But we are still far from our goal of financial wellness for every American. Despite all the innovations and tools available today, only 1 in 3 individuals in our society is prepared for saving enough for their retired life. There is still a lack of trust between investors and financial advisors. Jack has been and will always be an inspiration for us Bogleheads at Plootus in our endeavor to reduce the financial stress and make financial planning available free of cost. John Bogle may not be the most talked about individuals in the financial markets or even specifically in the investment arena, but in my view, he has done more for the average individual than anybody else. 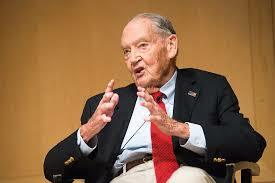 When Warren Buffet called him a hero, his response was ‘I’m no hero, I just give a damn about investors.’ The Plootus team salutes John Bogle. The stock market is in a panic. What to do with your 401k?